Theodore Roosevelt owned a little dog that was always getting into fights and always getting the worst of them. On one occasion, his dog tackled a mangy cur and took a beating. Someone said to Teddy, "Your dog isn't much of a fighter." "Oh, yes, he's a good fighter," replied the Colonel, "he's just a poor judge of dogs!" Here are some actual police responses to people that they have pulled over. These examples remind me of Theodore's little dog. "Yes, sir, you can talk to the shift supervisor, but I don't think it will help. Oh, did I mention that I'm the shift supervisor?" Here's another example. "The answer to this last question will determine whether you are drunk or not. Was Mickey Mouse a cat or a dog?" Another example is, "If you run, you'll go to jail tired." Now, let me give you another scenario of someone who chooses their battles wisely. A police recruit was asked during an exam, "What would you do if you had to arrest your own mother?" He said, "Call for backup." Now, there's a guy who knows how to choose a battle. The Scripture says in Ecclesiastes 7:9: "Do not be eager in your heart to be angry, for anger rests in the hearts of fools.” Someone once said that anger is a wind that blows out the lamp of the mind. It's easy in today's 'short fuse' world to get angry. We see things that need changing and we want them changed now! Anger not transformed is anger transferred. Don't fight every battle of any kind that catches your attention. Why? Because you can't! I can't. We weren't designed to fight every battle there is out there. Don’t become a person of war. It's one thing to be in war. It's another thing for war to be in you. When that happens, the end justifies the means and you start down a road that is more destructive than productive to your cause or issue. You lose perspective. You blame, demonize, and even break the law. Ultimately, you end up losing what you are fighting for and then become more hurt or angry in the process. Anger is one letter away from danger. 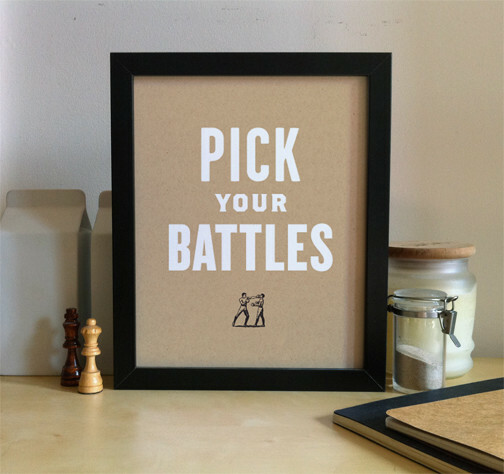 Don't take up battles that are not yours. Jesus chose his battles. Laurie Beth Jones in her book, Teach Your Team to Fish, talks about that. "Imagine how Jesus felt when He saw a Roman soldier hit a Jew, or watched people spit on prostitutes, or walked past crucified people in Jerusalem. This horror was a regular occurrence. Yet there is no record of Jesus leading any protest marches or overthrowing Roman tyranny or halting the execution of others. Why not? Didn't He care? Of course He cared. But Jesus was wise enough to choose His battles, to save His energy for the one battle He could win, the one that could change history -- not because He picked up His sword, but because He laid down His life." She goes on to say that balance, poise, knowing your place, knowing how and where best to apply pressure while maintaining grace, character and dignity, will ultimately get you closer, in the long run, to where you want to be. Here are some questions to ask ourselves. What battles am I in? Should I be fighting them? What business or calling am I really in? Am I battling to help the community or am I battling because of some unresolved issue in my life? Jesus chose His battles carefully and wisely. We can too! Otherwise, we become just another poor judge of dogs!